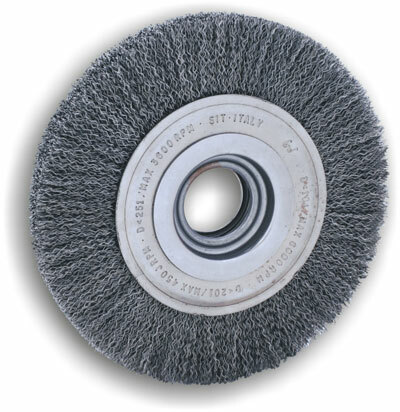 Wheel Brushes in very resistant crimped steel wire and with very high density filament. Available with several filaments of distinct thickness. 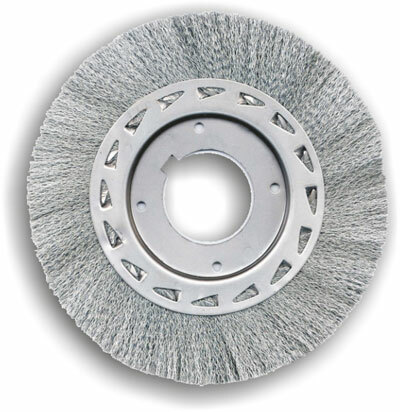 Applications: Deburring, satin finishing and polishing of surfaces of every material and shape. 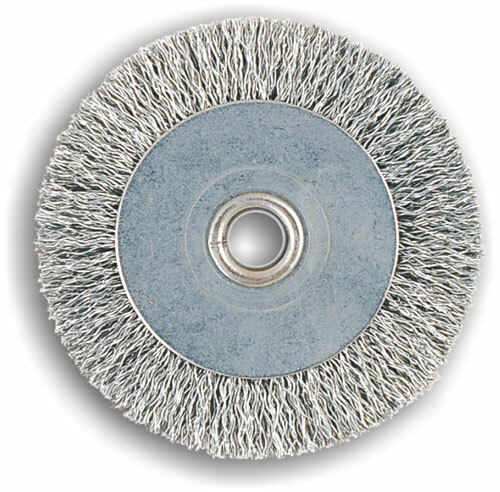 Wheel Brushes in highly resistant crimped steel wire and with very high filament density. The 6000 Series, diameter being equal, has 40% more filaments. 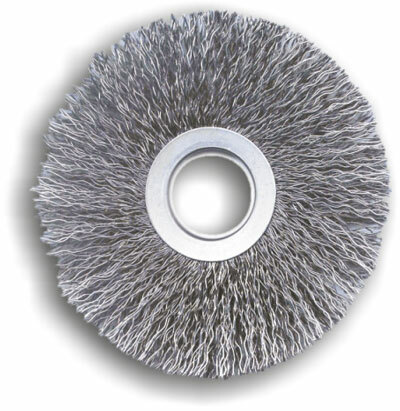 Applications: Deburring, satin finishing and polishing of surfaces of every material and shape. Suitable for industrial use. 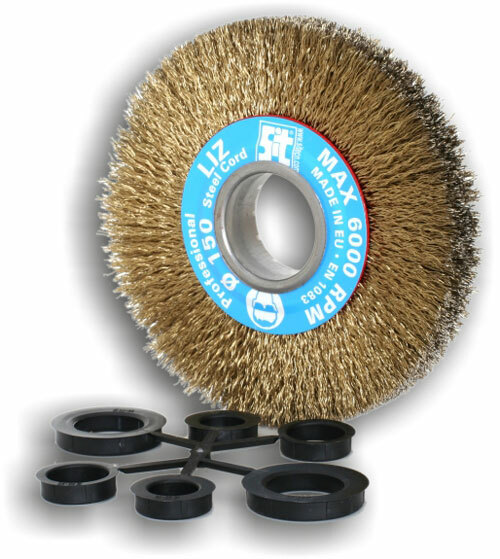 Wheel Brushes in crimped iron wire. The new series 10-12.000 have a higher density, are less protruding and have flanges of larger diameter. These features guarantee an increased level of aggression and higher durability. 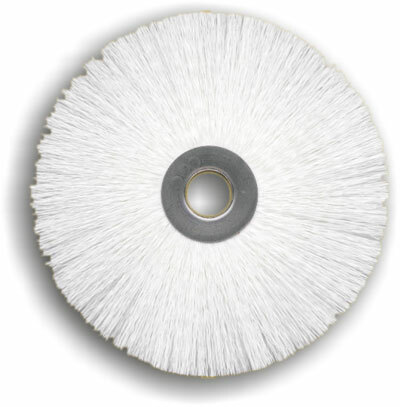 Wheel Brushes in iron wire twisted knots for heavy-duty jobs at high rotation speed. Applications: Deburring and aggressive mechanical pickling. 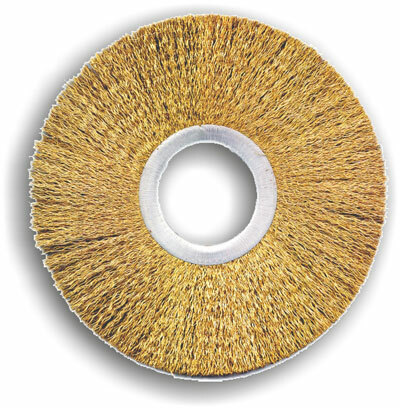 Wheel Brushes in steel cord brass-plated Liz which adds great flexibility and the ability to obtain different types of finishing depending on the pressure applied. Applications: Deburring, satin finishing and mechanical pickling. Liz is ideal for rubber processing but is suitable for every type of surface, from metal to wood to stone. 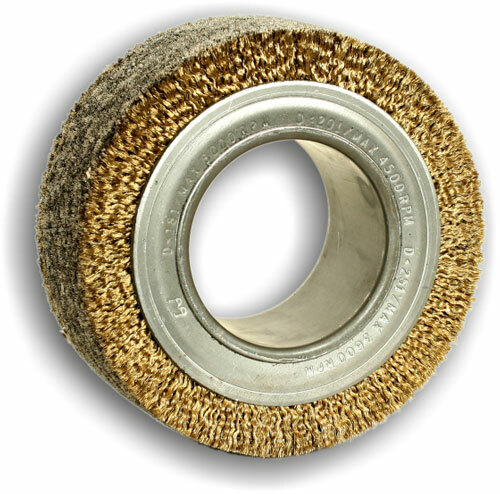 Wheel Brushes in brass-plated Liz steel cord, which makes it extremely flexible allowing to obtain distinct types of finishing depending on the pressure applied. Applications: Deburring, satin finishing and mechanical pickling. 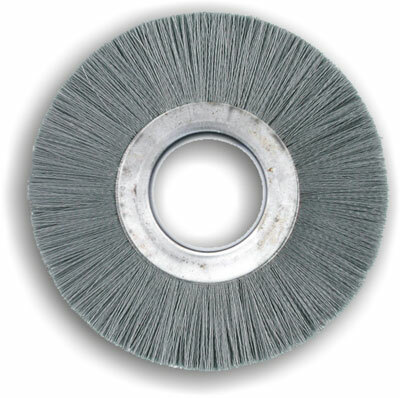 ILiz is ideal for pneumatic buffing machines and for the rubber industry but is suitable for every type of surface, from metal, to wood, to stone. Wheel Brushes in brass-plated iron. 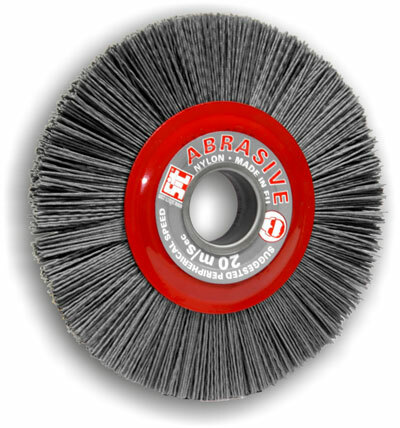 The "CE" series includes wheel brushes lighter and less expensive, with lower wire density. Applications: Deburring, satin finishing and polishing of surfaces of every material and shape, suitable for lighter and less continuous jobs compared to the "Industrial" line. 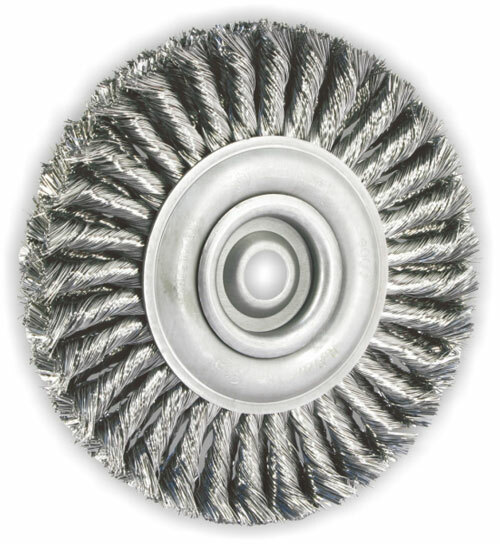 Wheel Brushes in crimped iron wire with high density of filaments. Applications: As spare parts of keys machines as a specific application. Adapters for wheel brushes, crimped wire cups and twisted knots. In plastic or iron, with key-ways if required. 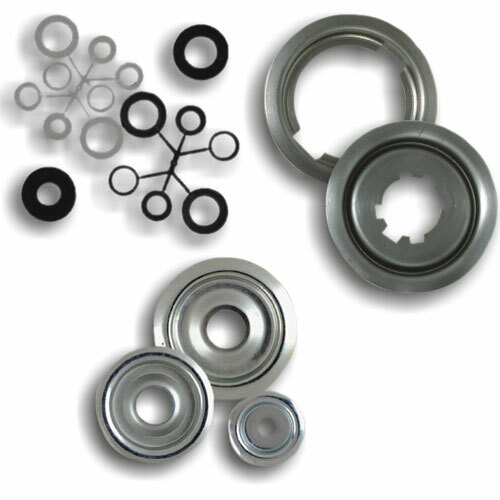 Applications: Tool diameter reduction to make the processing possible and more effective with every tool and machine. Rings/single unit brushes available in different materials (iron, ppl, Bessemer, and more) and sizes. Rings/single unit brushes with very high density of filaments and short trim length, available in different materials (iron, ppl, Bessemer, and more) and sizes. 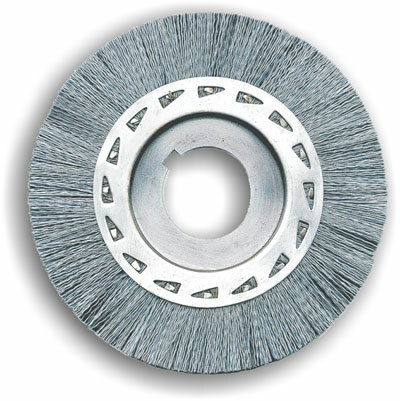 Applications: Deburring, satin finishing and polishing of surfaces of every material and shape. For aggressive applications, long life service. 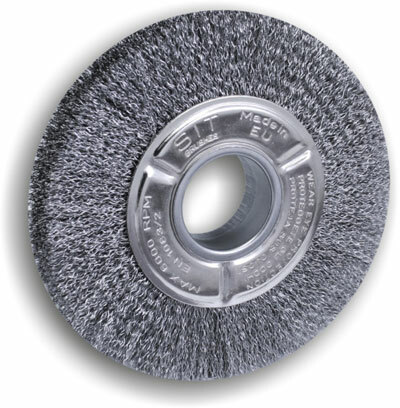 Wheel Brushes in abrasive nylon suitable for every type of surface, metal and non-ironus. Applications: Deburring, satin finishing, pickling, wood-aging. Mind the suggested rotation speed. Rings in abrasive nylon suitable for every type of surface, metal and non-ironus. Applications: Deburring, Satin finishing, Pickling, wood-aging. Mind the suggested rotation speed (For plastic and wood ideal peripheral speed = 20 m/s). 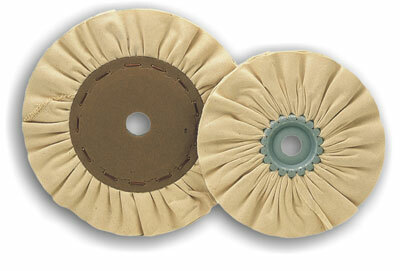 Type RC: in flaps of abrasive cloth and sponge. 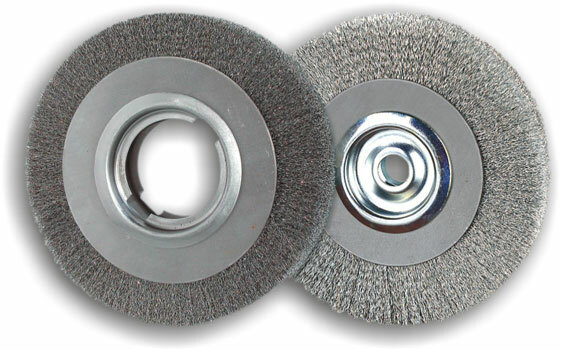 Type RF: abrasive sponge only. 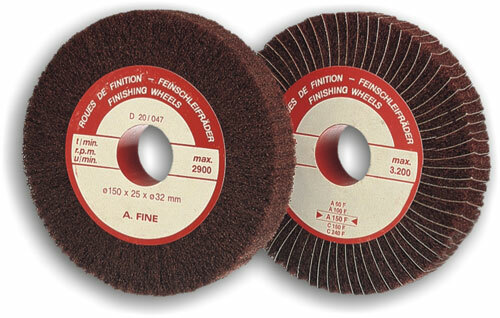 Applications: Ideal for finishing and satin finishing of with filaments. 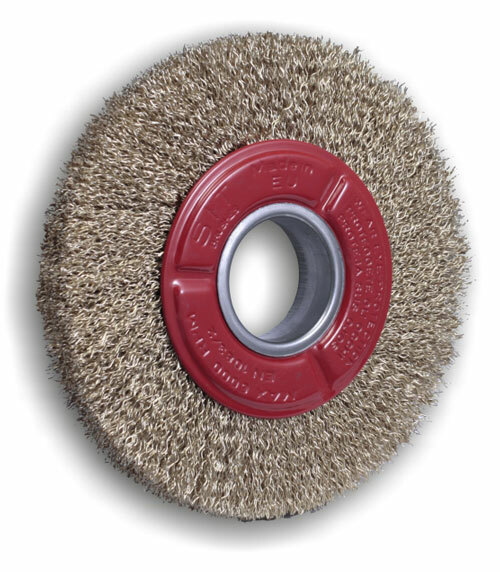 Applications: Ideal for cleaning and polishing iron and non-ironus surfaces with abrasive paste Dialux that you can find here.